Personalized Anchor Arch Address Plaque - - single-line address sign with an anchor inside the arch. Holds up to five 4" numbers or seventeen 1.25" characters. Made in the USA. Solid rust-free cast aluminum construction. Anchor, characters, and border are part of the sign, not added on. Personalized with your address or specified text and color scheme selection. up to seventeen 1.25" characters (can be mixed numbers & letters if desired). 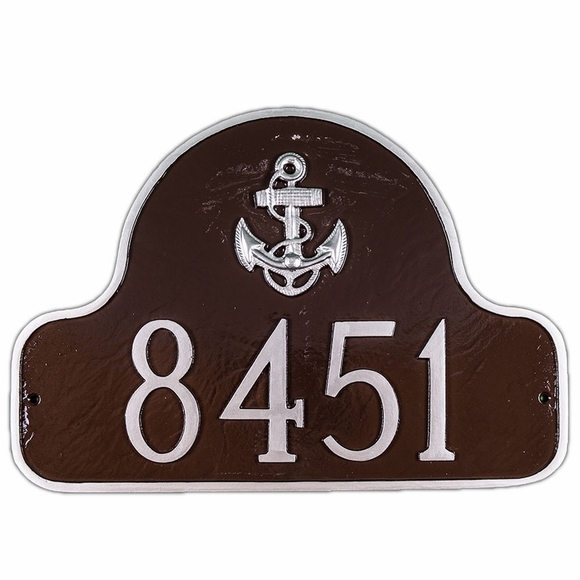 Personalized house number sign with anchor for boaters, sailors, and people who live by the sea.